The Games of the XXXI Olympiad will take place in Rio de Janeiro, Brazil from 5th to 21 August 2016. 10,500 athletes from 205 countries will contest 306 different events over 28 sports during the two and a half weeks of competition – all aiming to achieve the goal of being awarded the Gold Medal. The designs on the four coins include two new sports which are making a welcome return to the Games after a long absence and two of the newer events. 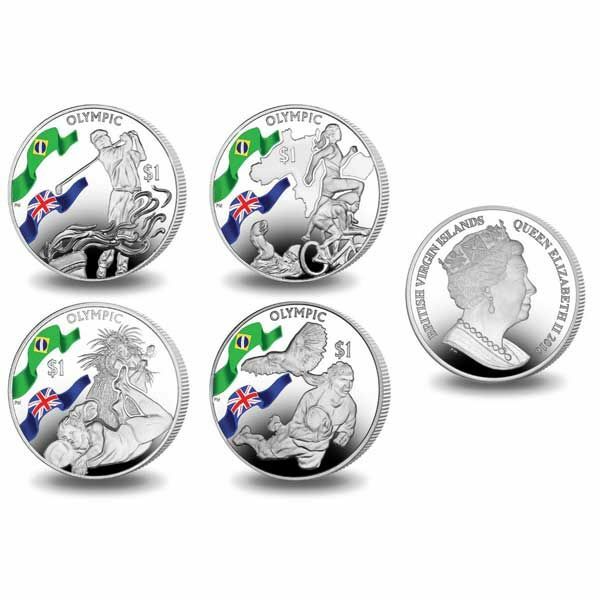 The coins are also available with the two ribbons featuring the Brazilian flag and Union Jack coloured making these coins a wonderful tribute to what is sure to be a colourful Olympic Games. The first design features Golf which is returning to the Games after 112 years. The image shown is that of a male golfer with a torch in the foreground. The next design features Rugby Sevens which is returning after a 92 year absence and shows a diving player with a Macaw, representing Rio de Janeiro, in the background. The third deign represents the Triathlon which appears for the 5th time in 2016 and shows a swimmer transforming into a cyclist who in turn transforms into a runner, illustrating the three disciplines. A map of Brazil can be seen in the background. The final design shows a female beach volleyball player diving for the ball with a lady in full Rio Carnival costume in the background. Beach Volleyball was first contested at the Games in 1996. 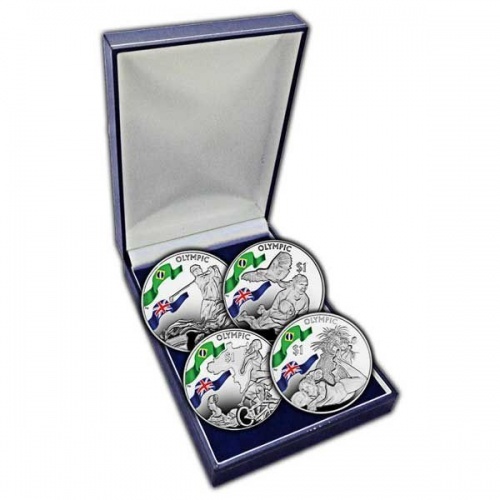 The coins are available here in Uncirculated Cupro Nickel and also in Proof Sterling Silver. The design features an image of each sport and another one representing either the Olympic Games or the host nation. 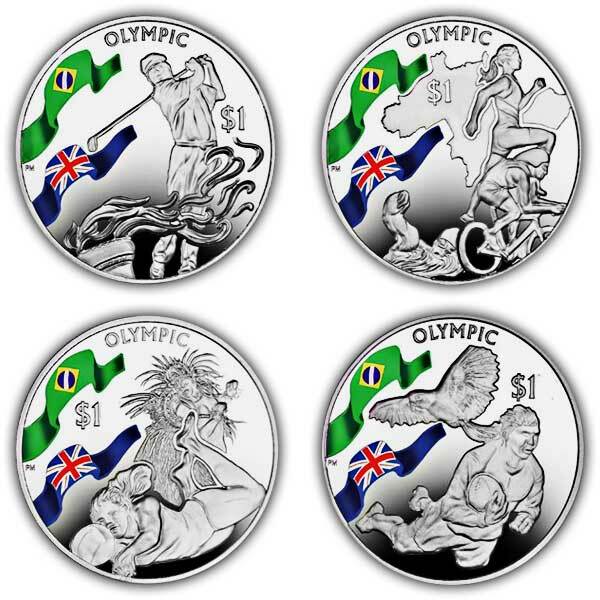 Each coin also features two ribbons, one which carries the Brazilian Flag and the other showing the Union Jack. The obverse of each coin carries an effigy of Her Majesty Queen Elizabeth II exclusively by Pobjoy Mint.